As a sailor myself, I really appreciate the value of this metaphore, and also how good is to translate the potentially “rejectable” (for foreigners) “America First” statement into a much digestible pill. Navy principles and values go beyond coastline. They are valid for modern societies and help building solid citizenship. Naval leadership concept is essential for a strong Nation. There is no satisfactory explanation for Trump. That was a very poor opening to this essay. ‘Nuff said there. As for the rest, I served in the Navy in the 1970s, on an SSN. I cannot honestly ever remember hearing, saying, or thinking “ship, shipmate, self” at any time or in any situation or command environment. We had no time for platitudes. We simply focused on first learning our jobs on board the boat, and then doing our jobs correctly. We never forgot that every man’s life, and the success in our boat’s mission, depended upon everyone doing their jobs correctly, whatever those jobs may be, from the CO down to the newest “non-qual” in the crew. 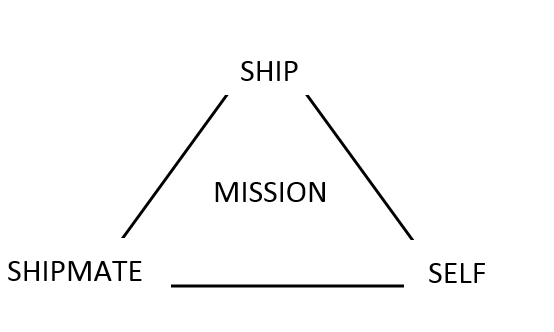 That worked out very well, and nobody had to waste any of their time and attention thinking on the philosophy of sailing ships, or worrying about generational differences. I don’t worry at all about today’s sailors, or the so called “millenials”, which is basically nothing but age related bigotry and a crutch for dumb people to explain human behavior in individuals. Young people don’t join the all volunteer Navy in order to lay about in their parents’ basement or any other such stereotypical and stupid characterization. There is no draft. People join the Navy and serve for many useful reasons, such as to see the world, to learn new skills, to test themselves against a demanding set of standards, or to emulate family members who served in an earlier time, and so on. Navy sailors are a self selected breed of people who do not need to be patronized with social pap. 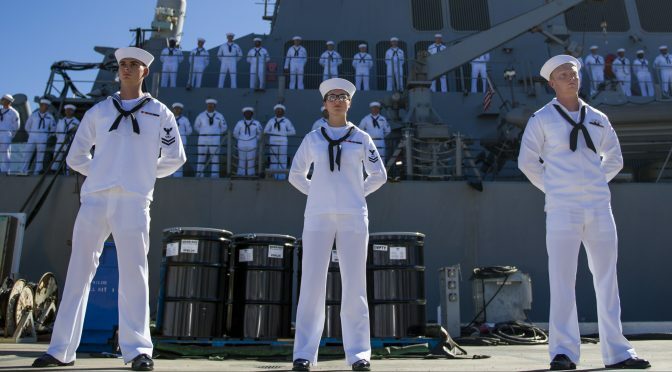 They just need to be made aware that by signing up, they are expected to learn their jobs, and then go do those jobs correctly so that the ship does its job correctly … and that in doing so, everyone aboard can come back home at the end of a patrol, a deployment, and a tour of duty safely, and take pride in jobs well done. My millennial crew – some of whom, like me, had even joined the military to serve their country (gasp!) – did an excellent job. They handled both the routine and the extraordinary (which seemed common enough to call routine) with great integrated dedication, and accomplished impressive achievements together, in pursuit of our missions. The strength of our military is its people.